It's said in the book's presentation, by Aragon, a famous French writer who translated the book from Kirghiz. It was told to me by a very dear friend who had loved it. I didn't think for one moment that I was going to agree! But yes, I did! To me too, it's the most beautiful love story ever. You've got to read to understand... The funny thing is that it also has something to do with Art - and the need to express the beauty around us. I had shivers almost all along as I read it. I cried in the end not because it was sad but because of the emotion... first time something like this happens to me! 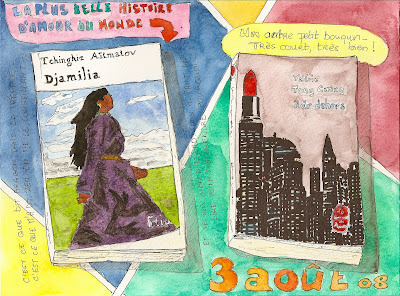 I've just looked on google and it's been translated in English if someone is interested, under the name "Jamilia". Sounds interesting :) I'll look it up! I just adore your book paintings. There is something so moving about them. Great journal page! And I love, love the postcards below! I'm going to see if I can find "Jamilia." Expressing beauty that's around is something that I think a lot about. I really need to get into this journaling. I owe you a million for getting me back to work! I check your blog every morning now:-)! I'm addicted! Spend some great tome at your blog here ! Great stuff !! Je ne connais pas les livres, mais l'idée de peindre ses lectures m'inspire énormément ! (C'est amusant, je n'habite pas du tout la même région que toi, mais mes parents oui et du coup j'en apprécie d'autant plus tes pages).